The widespread use of T lymphocyte-associated antigen-4 (CTLA-4) and programmed death (PD)-1 and PD ligand-1 (PDL1)-targeted agents in cancer patients as immunotherapy has raised some issues on their safety profile. Regarding infectious complications, it has emerged that these compounds do not intrinsically increase susceptibility to opportunistic infections, which mainly correlate with the co-administration of systemic immunosuppressive therapy (high-dose corticosteroids and anti-tumor necrosis factors inhibitors) to cure immune-related adverse events (colitis, hepatitis, pneumonitis and pancreatitis), well-known complications of these targeted drugs. These observations lead experts’ opinion to suggest primary anti-Pneumocystis prophylaxis in patients undergoing CTLA-4 and PD-1/PDL1 agents who will receive prednisone 20 mg daily for ≥ 4 weeks. Few data on invasive fungal infections in this context are available. We report here a case of probable invasive pulmonary aspergillosis (p-IPA) complicating first-line immunotherapy with pembrolizumab for metastatic lung cancer that was further aggravated by multidrug-resistant Pseudomonas aeruginosa superinfection of fungal cavities; the patient received concurrent systemic corticosteroid therapy as anti-edema treatment for cerebral metastases. 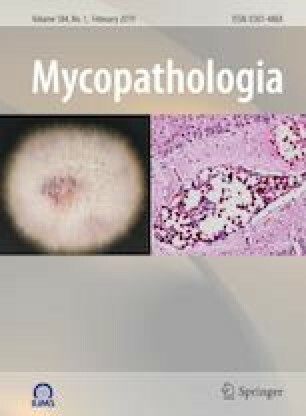 Reviewing literature about Aspergillus diseases in subjects receiving CTLA-4 and PD-1 and PDL1-targeted agents, we found three cases of invasive aspergillosis and one case of exacerbation of chronic progressive pulmonary aspergillosis after nivolumab treatment; to the best of our knowledge, this is the first report of p-IPA complicating pembrolizumab immunotherapy. Briefly, in this new setting of biological/targeted drugs, waiting for growing clinical experience, we recommend a high level of alertness in diagnosing any infectious complications. For this type of study, formal consent in not required.